San Antonio, TX (Blugolds.com)- The University of Wisconsin Eau Claire women's tennis team fell 9-0 to the nationally ranked Trinity Tigers on March 28. The Blugolds were down after losing three of three doubles matches. Natalie Wijesinghe (Apple Valley, MN) and Emily Cooper (White Bear, Minn.) kept things close losing 8-4 at number one doubles, while Hanna Zevenbergen (Baldwin,Wis./ Baldwin-Woodville) and Molly Stewart (Amery, Wis.) lost 8-5 at number two doulbes. Emma Barnd (Wells, Minn./Unites South Central) and Lindsey Henderson (Prior Lake, Minn.) were unable to break the Tiger momentum dropping their number three doubles match 8-4. The Blugolds unable to turn the table on the Tigers in singles action dropping all six points to Trinity. 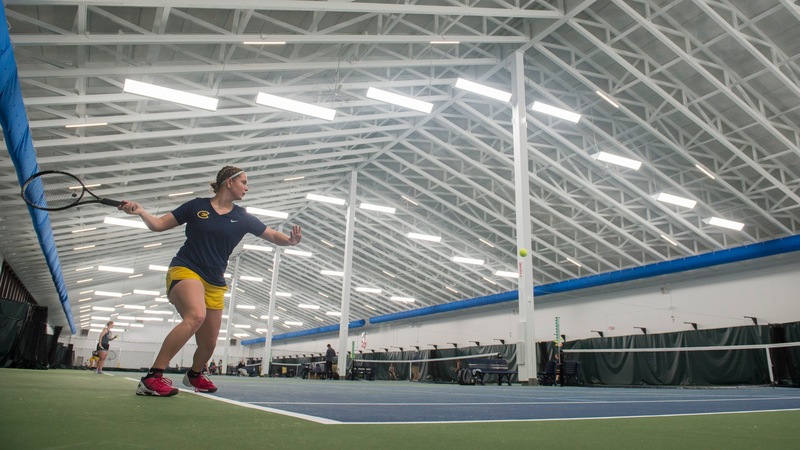 The Blugolds will look to bounce back tomorrow as they wrap up their spring break trip with a match against St. Mary's (TX) at the AnneMarie Tennis Center - San Antonio, TX. Follow the Blugolds on Blugold Game Day or on the 'UWEC Blugolds' app' on your mobile device.